We just so happened to get a FREAK snowstorm on the very day we were set to move, which made moving conditions not very favorable. Thankfully, between our family and friends we were able to make the move carefully and without anything getting damaged, it just wasn’t fun moving in the frigid temps. While we were getting settled into our new home, with most of our stuff still in boxes, I made good friends with our microwave! This mug cake is one of my favorite recipes to use when I need a quick dessert. It’s rich, chocolatey, and ready in just a few minutes. It’s also perfect for that late night craving, which for me usually happens right after the kids go to bed! I hope you enjoy this mug cake, friends! Have a great weekend! Single serving chocolate lava cake ready to eat in just a few minutes! It's dairy free, gluten free, and vegan too! In a large mug, combine together flour, starch, cocoa powder, chocolate chips, and salt. Stir in milk and maple syrup and then mix in the oil until well incorporated. If you mix melted coconut oil in with the cold milk it hardens into large chunks. Mix in the oil at the end, after the milk has been mixed in. Place the mug in the microwave and heat for 45 seconds to one minute. More or less time may be needed, depending on your microwave. 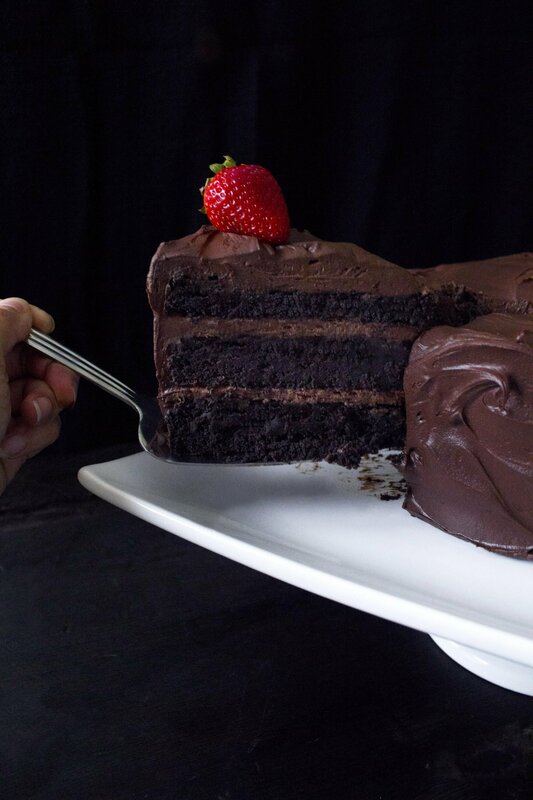 The cake should be mostly cooked with a pocket of chocolate sauce in the middle. If the cake is too gooey for you, heat in 15 second intervals until it's cooked to your liking. It doesn't contain eggs so there is no harm eating it undercooked. I like to top my lava cake with coconut whipped cream and fresh berries. Makes 1 cake. Place cold, coconut cream and honey in a small bowl. Use a small whisk or fork to beat until thick and creamy. Thank you! Have a wonderful evening! Can I use a flax egg instead of cornstarch or potato starch? If not what can I use? Can I use a flax egg instead of cornstarch or potato starch? If not what can I use instead? Could I make this in the oven? Thanks! I’ve never tried it, but I’m sure you could! Make sure it’s in an oven safe dish or cupcake mold though. I would say to bake at 325 or 350, but I’m not sure for how long since I’ve never made it in the oven before. Just watch it after about 8 or 10 minutes of baking. Please let me know how it turns out for you!! Thank you for this recipe! I make this recipe for me and my family at least once a week! It’s so yummy and easy to make! I really appreciate you taking the time to give your feedback, Jackie! This is our go-to dessert when we want something quick and delicious too. I’m so glad you and your family liked it! Thanks again! This looks great! It appears to be easy enough that I could even make it! Yes, microwave desserts are definitely the go-to treats for moving time, Lisa! I’m glad that you will have better weather for your move..no one should ever have to move in the freezing cold! There should be, like, a law against it or something;-) Thanks for stopping by, my friend! Haha, thanks Minna! It definitely makes a great “MUST HAVE CHOCOLATE NOW!” treat! Ooooh, this looks so freaking good! Pinned! Yay for single serving portions! I love little desserts like this to end my night – and as I’m often alone, it’s convenient for me to have a recipe that caters for one! And you’r back with a bang! What a great dessert. chocolate is such a lovely ingredient to work with and the pictures STUNNING!